This picture is a picture Margaret Gorman, who was crowned the first winner of the "Inter-City Beauty Contest" and was given a golden mermaid trophy because she was "the most beautiful girl in America." These two separate yet related events were forerunners to the present day Miss America contest. 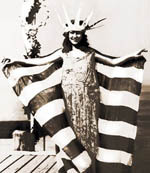 She even eventually came to be called Miss America. 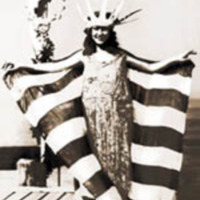 Miss America Organization, “The First Miss America,” The American Century, accessed April 20, 2019, https://americancentury.omeka.wlu.edu/items/show/102.